A solar pond is often brought up as an example of a power source that developing countries can easily operate. Solar ponds are cheap to build, requiring only land, pond liner and saltwater. But several important disadvantages to solar ponds may render them unworkable as a useful method of storing the sun's energy. A solar pond consists of a large pool filled with saltwater that's covered at the bottom with a reflective lining. 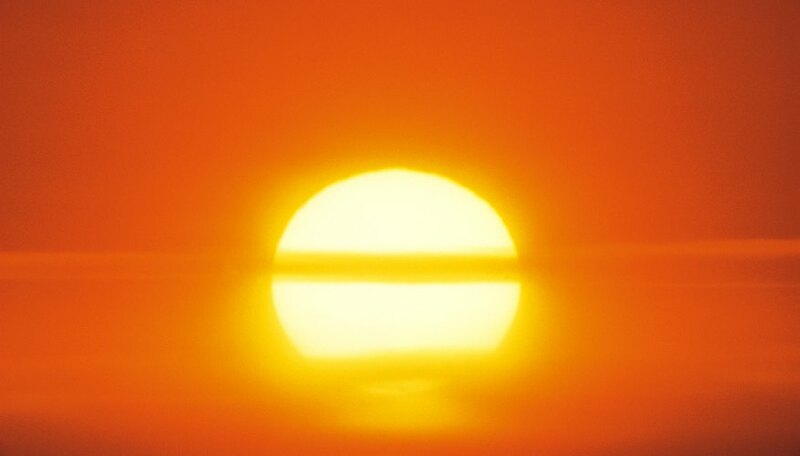 The heat from the sun will become trapped in the lowest layer of the water, which contains the highest saline density. In this setup, the heat cannot escape through the top of the pool by means of a convection current, as would happen with fresh water. The trapped heat can be used to do useful work, such as powering a Stirling engine, which operates through compression and expansion of air, or be used directly for heating. Although solar ponds are simple to construct, they are costly in terms of energy efficiency. The maximum theoretical efficiency of a solar pond is 17 percent, assuming that the hottest saltwater has a temperature of 80 degrees Celsius (176 degrees Fahrenheit) and the coolest water is 20 degrees Celsius (68 degrees Fahrenheit). Compare this to a power plant that can generate heat reaching 800 degrees Celsius (1,472 degrees Fahrenheit) -- the power plant has an efficiency of 73 percent. This means that the solar pond is significantly less heat-efficient than the power plant. To make use of the stored thermal energy in a solar pool, the hot saltwater at the bottom of the pool must be pumped out. This depletes the amount of water in the pool, so new saltwater must be added to the pool regularly. Furthermore, salt crystals, which can accumulate in the water, must be removed to prevent buildup. Solar ponds require a significant amount of land to function properly. Like solar panel arrays, the ability of solar ponds to capture energy is related to their surface area. If this land could be used for other, more efficient energy sources, a solar pond might be a wasted investment -- one pond in Israel took up 210,000 square meters for an electrical output of 5 megawatts. For comparison, this would power fewer than 5,000 American homes. Ernest Orlando Lawrence Berkeley National Laboratory: How Many Houses Can 1 MW Supply? Gellert, Andrew. "The Disadvantages of Solar Ponds." Sciencing, https://sciencing.com/disadvantages-solar-ponds-23243.html. 24 April 2017.